900MHz video transmitter for long range AV transmission. This wireless microwave transmitter enables you to send video between locations where hardwiring is difficult or impracticable. The transmitter operates on microwave radio system - no internet connection required, no bandwidth to worry about. It is therefore particularly useful in those remote locations where there is no internet/network coverage or out of WiFi range. Ideal for use in non-line of sight applications. Compatible with most video cameras with RCA or BNC AV outputs (NTSC and PAL auto detect). See a typical setup example here. Also available in 1.2GHz and 2.4GHz frequency bands. Transmission range: Range may vary substantially depending on the actual operating environment. Much longer range can be achieved in aerial applications. Range is about 1,500 feet (450 meters) in open space with high gain omni-directional antennas of 10dBi or higher. Longer distance can be achieved if high gain directional antennas are installed in a line of sight environment - see table below. Compared with other frequency bands such as 1.2GHz, 2.4GHz and 5.8GHz, 900MHz transmitter has much better penetration capability through obstructions. Ideal for use in non-line of sight applications where there are some unavoidable obstacles in the transmission path. Viewing live video feed over the internet or mobile phone. If you have a DVR or video encoder and other equipment connecting to the internet, you may connect the wireless receiver to one of the video inputs of your DVR/video encoder so that you can view the camera footage live in your local network or in a remote location over the internet on your cell phone. See a typical setup here. Power. Both the transmitter and the receiver work on DC12V power. Two AC/DC power adapters have been included in the package for this purpose. In those areas where AC power is not available, you may connect the devices to external DC12V battery such as solar-powered system or Sealed Lead Acid rechargeable battery. See Specifications below for power consumption details. Easy installation. Setup can be completed within minutes. NOTE: Different countries will have their own RF regulations governing the use of wireless equipment. It is your responsibility to ensure that your application complies with your local RF regulations. 1) Send video wirelessly from a surveillance camera to TV, monitor, computer, DVR. 2) Send video wirelessly from the surveillance camera at the main gate back to the house. 3) Send video wirelessly to the opposite building. 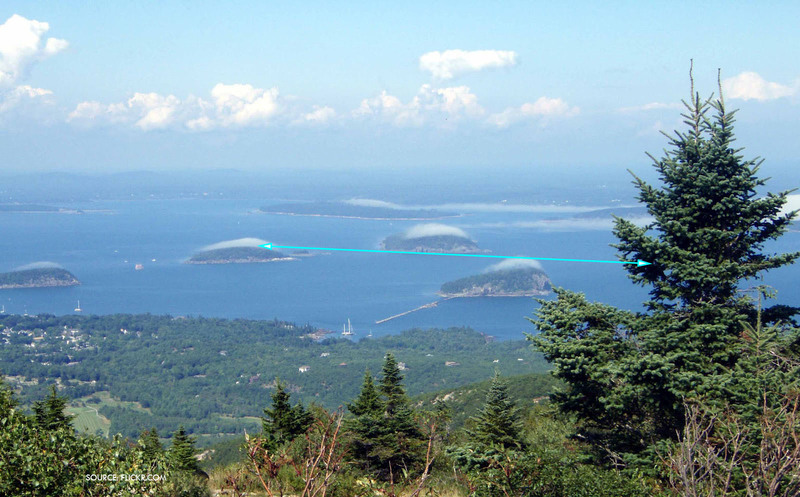 4) Send video wirelessly between two mountains. 5) Send video from an outlying island back to the seashore. 6) Send video from a medium-size UAV back to the ground. Antenna included 6dBi omni-directional antenna 3W: 6dBi omni-directional antenna included. Audio output/input voltage 10k Ohm impedance: 2Vp-p max. 1) If the transmission path is line of sight, the transmission/reception will be significantly improved by using directional antenna such as panel antennas. 2) For 5W and 10W transmitters, it is recommended to use antenna of at least 9dBi gain or above. 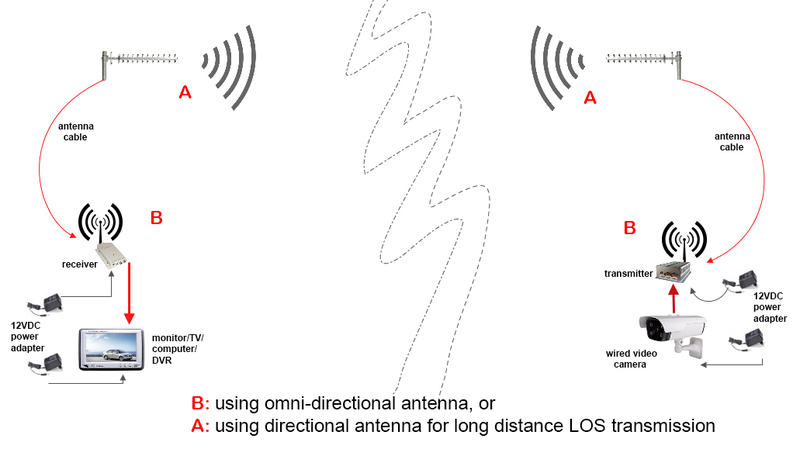 3) Directional antennas are used only if the distance between the transmitter and the receiver is a line of sight environment. 4) If it is necessary to use antenna extension cable, the cable should be kept as short as possible because, the signal attenuates directly proportional to the length of the cable, i.e. the longer the cable, the weaker the signal from the antenna. To minimize the signal attenuation, you may extend the distance between the transmitter/camera or the receiver/monitor by using high grade 75 ohm coaxial video cable such as RG6 cable - see illustration (Picture B) here. 5) When selecting the channel frequency, please make sure you do not interfere with other licensed device using the same or near frequency. 1) 4-channel 900MHz AV transmitter. A 6dBi omni-directional antenna (included for 3W model only). 2) 4-channel 900MHz AV receiver with a 6dBi omni-directional antenna. 3) One 12VDC power split cable. 4) Two 12V universal regulated power supplies. 6) One RCA AV cable for the receiver. ** UPS delivery option is not available for these antennas except panel antenna. Add an extension cable for the antenna(s) just ordered?